I think every case now comes with USB 3.0 on front panel, some come with USB 3.1 type-c. Great for users not that great for modders. These cables are big, bulky and its difficult to put a nylon/cloth sleeving on them in the usual way (and plastic sleeving simply looks ugly). I had this problem with my old case where after sleeving nearly everything i was out of ideas. With new case, i decided to solve this problem and i did it! 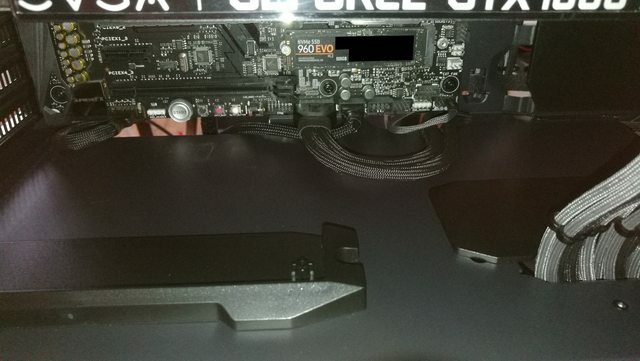 If the sleeve wont go over the connector why wont we approach it from different angle? Lets wrap the sleeve around cable! Sleeving cable this way of course, has a flaw, there will be a seam along the cable, but given that its only visible from one angle/side, we can always somehow hide it inside case and enjoy sleek and nice sleeved look of that pesky USB 3.0 cable. The method is universal, you can use to to sleeve other difficult cables, like USB 3.1, SATA data or PSU power cable. End, result does not look that bad, doesn't it? Oh, man! I wish vendors would do this from the factory, especially on their premium $150+ cases. They could sleeve from the connector and have it perfect. Thank you, I've been already getting some feedback and i think the method could be improved even further. Using an a hot knife it may be possible to melt the seam into sleeving so its even less noticeable. The other suggestions mentioned giving up on stitching and fuse the cut in sleeving by melting the edges of sleeve together to make an uniform seam. This method seems less likely to succeed based on my experience with nylon and how it behaves. Thanks for sharing your "trick"
Very nice guide, thanks for sharing.